BALTIMORE, MD: Concert Artists of Baltimore begin their 31st season with the works and legacy of America’s beloved George and Ira Gershwin. WBJC’s Jonathan Palevsky guides the audience through an evening of the music and songs that became the very definition of Broadway and the Jazz Age. A magical evening set in Friends School beautiful new concert hall, with performances by the prize-winning American pianist John Nauman. Performance Location: Friends School, Forbush Auditorium 5114 N. Charles Street, Baltimore. Performance Date: Saturday, October 7, 2017, 7:30pm. Tickets are $30 for adults and $10 for students with ID. Visit www.cabmusic.org or call 410-625-3525 ext. 101 for tickets. This concert is sponsored by the Henry and Ruth Blaustein Rosenberg Foundation in memory of Ruth Blaustein Rosenburg, and the Peggy and Yale Gordon Trust. Concert Artists of Baltimore is funded in part by an operating grant from the Maryland State Arts Council, an agency dedicated to cultivating a vibrant cultural community where the arts thrive. This program is also made possible in part through the sponsorship of the Baltimore County Executive, County Council, and the Commission on the Arts and Sciences, and Baltimore Office of Promotion and the Arts. An established brilliant classical pianist, John Nauman “is a leading exemplar of the American school, achieving profundity and beauty through a powerful and completely relaxed technique.” (Fort Worth Star Telegram) A charismatic and passionate performer, Mr. Nauman is uniquely gifted in his ability to communicate those qualities to his audiences. A native of Maryland, his teachers have included Adele Marcus, Sascha Gorodnitski, Herbert Stessin and Julian Martin. Mr. Nauman held the prestigious Van Cliburn Scholarship at The Juilliard School where he received his bachelor’s and master’s degrees. Currently, Nauman is completing his Doctorate of Musical Arts degree at The University of Arizona. As grand prize winner of the American Music Scholarship Association Competition, Mr. Nauman received critical acclaim for his debut recital at Alice Tully Hall at Lincoln Center, New York. In addition, Nauman has garnered top honors at international piano competitions including the Joanna Hodges, the Stravinsky Awards and the Xerox Affiliate Artist Program. He has also been featured in Joseph Horowitz’ book The Ivory Trade and on ABC-TV’s “Nightline” documenting the Eighth Van Cliburn International Competition. 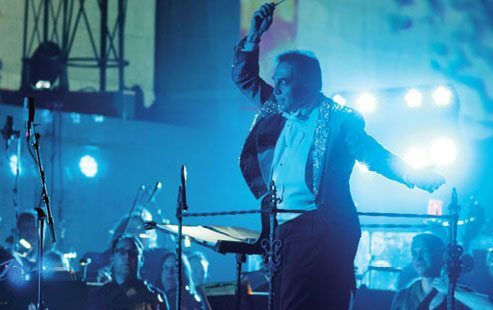 An active performer, John Nauman has appeared with major orchestras from Boston to London, including the Atlanta Symphony, the Boston Pops at Symphony Hall, the Phoenix Symphony, the Rochester Philharmonic, the Utah Symphony, the Baltimore Symphony, the Midsummer Mozart Festival Orchestra-San Francisco, and the New Orleans Symphony Orchestra under the baton of Maestro Maxim Shostakovich. Mr. Nauman has also appeared as recitalist in such distinguished venues as The Gold Medal Winners Series at the Ambassador Auditorium in Pasadena, the Annenberg Theater in Palm Springs and Old First Concerts in San Francisco, and Boston Symphony Hall, among others. European appearances include the Academy of London Orchestra at Saint John’s Smith Square, the Tampere Philharmonic Orchestra in Finland and the Davos Music Festival in Switzerland. A recent tour of China included concerts in Nanning and Shenzhen. Mr. Nauman also played on Evenings with Steinway in Bellevue, Washington. Mr. Nauman toured Japan with violinist Ayako Yonetani. Several of his concerts have been videotaped for television by N.H.K. Japan. An International Steinway Artist, Mr. Nauman has performed at the Metropolitan Museum of Art in New York for German Chancellor Helmut Kohl. Recent engagements include a tour of China, Evenings with Steinway in Seattle and two performances of George Gershwin’s Rhapsody in Blue with the Tucson Chamber Orchestra. Mr. Nauman has collaborated with Anne Akiko Myers, Zuill Bailey, Stephen Hough, the Tackas String Quartet, Audra McDonald, Adam Guettel and Ricky Ian Gordon. He held an Artist-Faculty position at the Aspen Music Festival and School from 1997- 2004. John Nauman was on the piano faculty of The Juilliard School’s Pre College Division. His solo disc Fantasy, produced by multiple Grammy Award winner David Frost on the Newport Classics label, containing works by Liszt and Scriabin is available at amazon.com. A recording of the Rachmaninoff Cello Sonata with cellist Adam Grabois on the Reflex Edition label is also available at amazon.com. Tom Frost introduced John to the legendary Vladimir Horowitz (Tom Frost produced Horowitz’s records). John was also influenced by meetings with the great pianist, Jorge Bolet and spent summers in Tanglewood with Leonard Bernstein. Nauman recently recorded the complete piano collection of Ricky Ian Gordon for Blue Griffin Records. Maestro Polochick is founder and Artistic Director of Concert Artists of Baltimore, an all-professional orchestra and all-professional vocal ensemble of seventy musicians, which is celebrating its 31st season. 2017-2018 also marks his 20th season as Music Director of Lincoln’s Symphony Orchestra in Nebraska. From 1979-1999 he was on the staff of the Baltimore Symphony as Director of the Symphony Chorus and since 1979 he has been at the Peabody Conservatory as Associate Conductor of the Orchestra, Director of Choral Ensembles, and Opera Conductor. Since winning the Leopold Stokowski Conducting Award and conducting the Philadelphia Orchestra, Maestro Polochick has attracted attention as an orchestral, operatic, and choral conductor. His appearances have included the Baltimore Symphony, Houston Symphony, Chautauqua Symphony, the Opera Company of Philadelphia, the Aalborg Symphony of Denmark, Omaha Symphony, Jacksonville Symphony, Daejeon Philharmonic in Korea, St. Petersburg Symphony in Russia, and the State of Mexico Symphony Orchestra in Toluca, Mexico. In 2000 Edward Polochick received the Peggy and Yale Gordon Achievement Award and was made an honorary member of the Baltimore Music Club. Two years later he was awarded the coveted Johns Hopkins University Distinguished Alumnus Award. In 2004 he was named Baldwin Scholar at the University of Notre Dame of Maryland where he held lectures, demonstrations and panels on the creative act of music. With his success in building LSO’s season and adding July 4th concerts, he was awarded the ‘Keys to the City’ by Lincoln’s Mayor in 2007. In 2010, as a result of Maestro Polochick’s significant contribution to the quality of life in Nebraska, he received a commission from Governor David Heineman as an Admiral in the Nebraska Navy. Founded by Edward Polochick and in its 31st year, Concert Artists of Baltimore (CAB) consists of a professional chamber orchestra and professional chamber chorus. The full ensembles are featured in The Maestro Series, with performances this season at Westminster Hall, St. Pius X Church, Friedberg Hall, and the Baltimore Basilica. CAB also offers chamber music, The Mansion Series, with performances at The Engineers Club at the Garrett-Jacobs Mansion. This series showcases smaller forces, such as a quartet or small vocal group, and often features unique repertoire. The orchestra and chorus are frequently hired for performances throughout the region by other organizations, including the Baltimore Symphony Orchestra, the Lyric Opera Baltimore, Moscow Ballet, Ballet Theatre of Maryland, the Baltimore Basilica, Temple Oheb Shalom, Johns Hopkins Medical Institutions, McDaniel College, St. Louis Church, The Holocaust Museum, The Visionary Arts Museum, The Greek Orthodox Church of St. George, and Catholic Charities. When larger forces are needed, such as when the singers of Concert Artists perform Messiah with the Baltimore Symphony Orchestra each year, the chorus expands to the Concert Artists Symphonic Chorale. In 2015 CAB produced a groundbreaking collaboration with the Baltimore Rock Opera Society at 2640 Space, a partnership that continued into 2016 at the Light City Baltimore Festival.